So many times, I have heard from women that they are ready to receive our Vaginismus Botox Treatment and be on their way to healing but they hit a practical roadblock – lack of money. Although I know it may be scary or difficult to ask for help, Iencourage my patients to tell family, friends and church groups about their condition to spread awareness and to possibly obtain financial support for their treatment and travel expenses. There has been a taboo surrounding discussing vaginismus for too long that has prevented women from receiving the treatment they need and deserve. After your courageously share your situation and reach out, you may be surprised by the compassion, love and help that is awaiting you. Recently, I was introduced to an amazing fundraising resource for people who need help with medical-related expenses when facing a health condition or illness. It is called Give Forward. This website creates a user-friendly platform to ask friends, family, and even caring strangers to make donations towards your treatment and travel expenses. Starting a fundraiser takes courage, but Give Forward makes the process easy, joyful, and memorable. 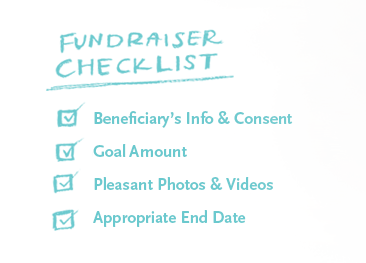 You can easily share your fundraiser through email and social media. You can also enlist those closest to you to become “team members” and help you get the word out and make your campaign touching and personal. Give Forward also has amazing resources to help you make you fundraiser successful. Check out this Give Forward article: 17 Fundraising Ideas to Raise More Money. It is filled with wonderful suggestions. And…. they even assign a personal Fundraising Coach to each and every fundraiser, to provide you with guidance and support. Your coach will be available via phone, email or live-chat. While there is a small fee for using Give Forward, 95% of the time, donors cover it. It is 7.9% plus $0.50 per transaction which covers the payment processing center, the technology, and personal support. You can read more about the fees here. So often, we see friends, family or even strangers that are going through something challenging and we wish we could help make their lives easier and better. When you have the courage to ask for help, you create the opportunity for someone to practice compassion and altruism. This warms everyone’s heart and brings people closer together. When you share your story and open yourself up to those around you, you may be surprised to see how much love pours in. It is very life-affirming and reminds us of the good in all people.